Patagonia at last. It's actually a little tricky to sort out exactly where Patagonia starts, but most seem to say it starts somewhere around the lakes region in Argentina. 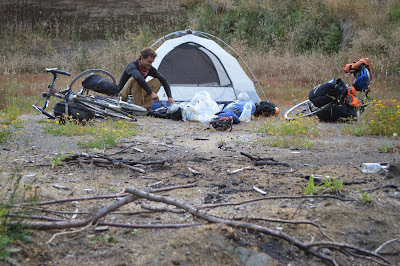 We ended up spending a couple of days in San Martin resting up, and figuring out our onwards route. Glenn did a lot of research and tried to arrive at the perfect route which would maximize time in the green, and yet minimize time on dirt roads. The Pacific side of of the Andes are lush and green, but there are many bad roads. While the Argentine side of the Andes are a lot drier, and flatter...with more paved roads. After hours of research, Glenn finally came up with the plan. We would cross back into Chile, ride down Chiloe island, then take a ferry over to the mainland and the carretera austral. Then we would cross back into Argentina, appropriately, at the town of Chile Chico. From there, into the flats and browns towards the Atlantic Ocean and Ushuaia. We are just part way through this route, and so far it has been fabulous.... Although, we have had quite a lot of rain and frustrating road work.... But it has been green green green! We left San Martin under sunny skies. The area seemed to be experiencing a bit of a heat wave, up to low 30's - normally it does not get much higher than low 20's. It made for hot biking, but little did we know, this would likely be our last warm weather cycling for weeks, maybe months, to come. We rode along the famous seven lakes route, it was stunning, but it seemed that everyone was out enjoying the weather as well...so the traffic was a little heavy at times. The first night we camped at a free campground. It was quite full, but right on the lake and we tucked ourselves at the edge far from cars and other campers. It was so warm, I even went for a swim! Unfortunately, there was a lot of guitar playing late into the night, so it was not the best sleep...but guitars are better than giant sound systems! The next day we began the 26 km gravel section of this route almost immediately. It was not too bad at the beginning and the end, but in the middle it was quite unpleasant. Very challenging to find a rideable route, and a lot of traffic getting in the way. But, luckily most vehicles were not in a rush so they would just wait behind us as we slipped and struggled up the hills. We finally made it back onto the pavement, and breathed a sigh of relief. Later on, we turned towards the Chilean border, and away from Bariloche. We were expecting this to be a busy road, but traffic was refreshingly much lighter! As we carried on, the landscape changed... There was a lot of what seemed to be sand everywhere. We stopped at a little shop to buy some supplies and asked the shopkeeper why there was so much sand. She told us that is was in fact ash, as the Volcano Puyehue had erupted two and a half years ago. This volcano is on the Chilean side, but because of prevailing winds, the ash and rocks mostly ended up in Argentina. It was good to put the landscape into context, but the scene was very strange. We found a lovely free spot to camp, on a little lake. The bottom of the lake and the surrounding area was covered in small light weight volcanic rocks. In fact, the dry ones would actually float! It was a peaceful night, as there was only one other family there. Today we crossed the Andes for the sixth time, although it is getting a lot easier. This time it was only 1250 m. We climbed through more ash covered mountains, and had some dramatic landscapes. Then we descended, the landscape continued to be covered in ash, but by around 400m, it was green once again. We had not planned our food too well on this stretch, and somehow we had very little food this day...mainly noticeable in a shortage of snacks. This meant that by the time we were looking for a place to camp, our stomachs were growling and we were feeling weak. Luckily we found a place... that did require a little fence opening... and cooked up some pasta to satiate our hunger! After a couple days of very wet riding we finally arrived in Puerto Montt. It was pouring rain when we got there, and we spent some time looking for a place to stay. We finally settled on a cute hospedaje run by an older gentleman. Our room had about five lines of rope, drying our clothing and we were just delighted to be in a warm, dry room! We ended up taking a day off in Puerto Montt, one reason was that rain was forecasted all day... So, of course, no rain came at all! From Puerto Montt we headed towards Chiloe Island, we were pretty excited because people had been telling us about how beautiful it was for some time now. We headed out of town along the coast, through small and some not so small fishing communities. We were lucky to have some blue skies. Then we climbed up to the dreaded highway five (the Panamericana), which turned out to be not so bad. For a good deal of the time we had a whole freshly paved lane to ourselves, as it had not been opened to traffic yet. Rain did set in later in the afternoon, but we just pressed along. At the end of the day we took a short ferry ride to Chiloe island and biked a few more kilometres to find a place to camp. We carried on to the town of Ancud, where we stocked up on supplies. From there the riding was hilly and the road quality was not that great, many potholes and no shoulder! This is actually a continuation highway five and many big trucks travel the route and are loaded onto a ferry to more southern communities. But, it certainly was beautiful... Lakes and hills and a lot of wooden churches. Magically, the road improved greatly after about 40 km... Lovely pavement and a shoulder! That night we had an excellent riverside campsite, but we did have to be on the lookout for our neighbours which inhabited the 20+ beehives! We had a short day to Castro, I had been feeling a little under the weather for the last few days...upset stomach, shoulder pain and such. It was rather frustrating, and I think that in retrospect it may have been related to stress. We (or maybe I...) have been thinking a lot about our plans for when we get home... We haven't come up with anything concrete yet. I guess that part of me thought that during this trip we would have giant revelations about our lives, our careers etc... Yet we remain just as indecisive as always, in seems. But... The next day was my birthday, so no time for stress! We rented a little cabana, and had a very very relaxing couple of days looking out at the ocean. We took a leisurely two days to get to the bottom of the island, and the town of Quellon, where we had tickets for a ferry back to the mainland. The riding was hilly, but the traffic was much lighter. We did need to contend with some more unfortunate roadwork and rain...but it is all part of the deal! We found an excellent camp spot right on a lake, and next to an abandoned house frame (perfect for stringing up the tarp). We arrived in Quellon early afternoon, and discovered that according to one brochure, it is actually the 'end' of the Panamerican highway. Pretty wild... we've biked the length of it already! Our boat left from a few kilometres out of town, so we stocked up on groceries and rode to the dock, where we cooked some dinner. The ferry did not leave until 10:30 pm, and would take 12 hours...so we boarded prepared with our thermarests and sleeping bags. The ferry ride was interesting... The seating area was very crowded, so we headed to the top deck to lay out our beds. I was quite excellent, until the rain started. We rushed back inside, and squeezed into a corner. Not the best sleep ever, but better than none at all. In the morning it was pouring rain; heavy, hard, seemingly unending rain. Upon disembarking we stumbled around a bit, or rather rolled around a bit... And eventually found a guy who had a campground, but also an empty room (with a roof) that we could set up camp in. That we did, and slept for the afternoon. In the morning, I broke down and bought myself a pair of rain boots...good old heavy high tops. Glenn bought rain boots way back in Peru, and I laughed, but when it rains, his feet are always dry...and my shoe covers are soaked through and torn up from walking on them. Turns out every cyclists should carry rain boots! We were ready to take off fairly early (by our long day standards), but our bikes were being held hostage in the workshop next door. The owner hadn't turned up to unlock them. Glenn had to go and ask the shop keeper next door to call the owner...and finally he came back! We had 13 km of gravel and then we were onto the pavement. Even though there was some drizzle and it was still very cloudy, the scenery was green, lush, and dramatic... Mountains, glaciers, rivers and lakes. We carried along, slowly climbing and found a place to camp in a field. The next day the weather was pretty good too, with only light rain on and off. Most importantly we had an excellent tailwind! We got to Villa Manihuales in the afternoon and headed for the Casa Ciclista! Yes, in this remote little town there is a Casa Ciclista! We waited for a couple of hours, and sadly no one showed up, so we pushed on and found another lovely spot on the river. Then we hit another one! We were planning on taking two more days to get to the city of Coyhaique, but we ended up doing it in a day. The weather was rainy in the afternoon... but we had strong tailwinds, making the situation very speedy. Still, it was a long day for us, and it was pouring rain (sound familiar?) when we finally got to town...and every hostel was very pricey, but finally we found one that was somewhat reasonable and relished in the warmth and dryness! We are taking a day off here...and yet again, its sunny out! Hopefully we will have some more sun in the days to come as we are hoping to do a little hiking before we leave the mountains.